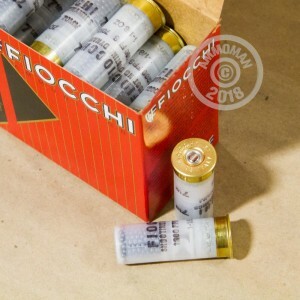 These Fiocchi target loads are a great combination of quality and affordability. Fiocchi did not cut any corners when making these promotional range rounds. Each shell in this box of 25 is 2-3/4" holds 1-1/8 oz. of #7.5 shot and has an average velocity of 1,200 feet per second. Consistency is what you can expect from this Target Shooting Dynamics line of ammunition. Since 1876 Fiocchi, an Italian company, has been producing ammunition. They have a manufacturing facility in Ozark, Missouri that loads these shells. 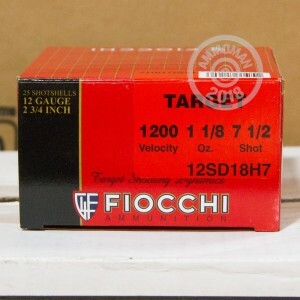 So pick up a few boxes of these target loads and see why Fiocchi is still an industry leader after 140 years. Stock up and save more! All orders over $99 qualify for free shipping from AmmoMan.com!